EXCELLENT LOCATION...N. SHORE OF HENRY'S LAKE & 15 MIN. TO WEST YELLOWSTONE! Fully equipped, two bedroom, one bath just steps from the infamous north shore of Henry's Lake in Island Park, Idaho. Located conveniently right off of Highway 87, within 5-10 minutes of the Montana border and 15-20 minutes to the west entrance to Yellowstone National Park. Each bedroom has a queen bed and an additional comfy bed hides away in the living room couch. Very close to Yellowstone, Montana lakes, & rivers, public lands, and all the beauty that Island Park invites! Would love to have you stay the whole season: May thru Mid-October; the longer you stay the less you pay!! !--CALL US DIRECTLY OR EMAIL FOR LONG TERM RATES. Also, if your dates aren’t available for this cabin, try our Madison River cabins at vrbo.com/969358 or vrbo.com/969335 or just give us a call...we might know of something that isn’t on the calendar. Greg and Tracie were married at Henry's Lake, Island Park, Idaho in 1996...having moved to Montana years later, they are raising a family with four children, and subsequently started returning to the area to work and recreate with their children throughought the spring, summer and fall months. They enjoy sharing their cabin with others and welcome you to come visit. The location of the cabin on the North Shore of Henry's Lake is fanatastic! We love it! The fish are big and the views are incredible. 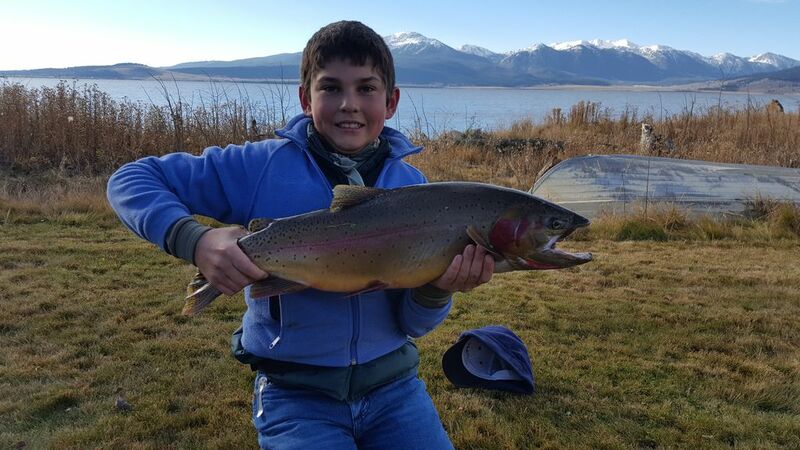 Henry's Lake, Island Park, Idaho--world famous for big trout! Access to cellular phone tower reception is excellent in the area; No land line is provided. Access to cellular phone tower is excellent for use with iPads or Smartphones; WIFI is not provided. We use the deck a lot for wonderful outside dining with the view of Henry's lake and surrounding mountains. State park access for canoeing on east and west side of the Henry's lake...10 minute drive. Big Springs waterway is located within a 20 minute drive, beautiful & scenic float. State park access for boating on east and west side of the Henry's lake...10 minute drive. Multiple lakes located in Idaho and Montana within 20-30 minute drive. Modernized, tidy cabin with a homey feel that is conveniently/centrally located. Owners easy to deal with and prompt to respond. TV with DVD (bring your own library), but no cable. If needed, bring hotspot as there is no Internet access. The cute little cabin oversees Henry Lake visible from the deck. While, the cabin was difficult for us to find at night, Tracie was really kind to direct us and even stop by late at night to ensure we had everything needed. I believe other reviewers have stated this, but truly if you ever have the thought "oh, wish we had that or forgot to bring that", open a cupboard - it is mostly likely there. Overall, very comfortable and very quick/straightforward drive to the west entrance to Yellowstone National Park. Thank you Tracie and family for a wonderful time and sharing your sweet cabin with us! Wow, the cabin was super clean, including the grill. What a great cabin with new everything. It appeared the entire cabin was renovated including the appliances. We loved the serenity and getting away from the crowds at Yellowstone. Perfect location, great scenery and outstanding outside deck with fireplace and very clean grill. Having the abundance of firewood and smoores supplies was a nice amenity. Great job Tracie. Wonderful owners to work with. Perfect place for a Yellowstone visit. Quiet, peaceful & comfortable. All sites Owners were great to work with. Would highly recommend this little cabin. Please come and see us again, very glad you were pleased! Great little cabin with a beautiful view of Lake Henry! Our family loved staying at this property. It was beautifully maintained and the owners were readily available to look after us. We needed some extra kitchen towels and they delivered them same day, with some fun postcards and coloring pages for the kids. A thoughtful extra!! We loved the deck and fire pit. We roasted marshmallows several nights. The cabin was centrally located for the activites we were taking in. Close to West Yellowstone, Big Springs, Mesa Falls and Cliff and Wade Lakes. Can't wait to return next year for more fun adventures!! So very close to Yellowstone National Park and all the outdoor adventure one could dream of...we have lived here for 25 years and still haven't seen it all.